The Juice Fountain Duo also known as Breville BJE820XL is a centrifugal type juicer that is actually two machines in one. This commercial quality juicer is not solely for juicing, but also for puréeing soft fruits for healthy smoothies. Constructed with stainless steel, die-cast metal base, this heavy-duty juicer is very sturdy, weighing in at about 16 pounds. This 1,2000-watt motor generates speeds from 6,500 up to 13,000 RPM and comes with five-speed settings, allowing for more control over how you juice. All of the parts that touch the food are BPA free. It comes with a special sensor that shuts the machine off if it becomes overloaded or overheated. 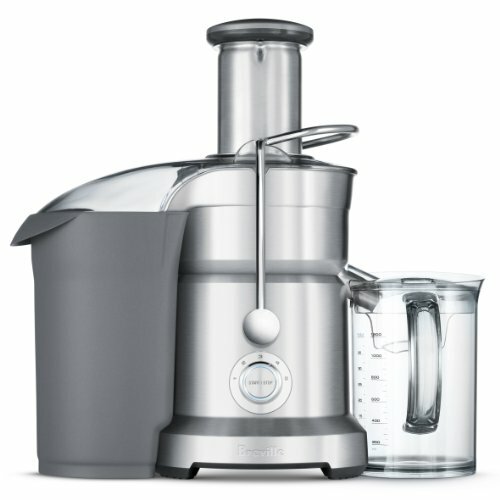 This powerful electric juicer is capable of juicing anything you put down the three-inch feed tube. If you do not enjoy cutting up your produce, then this machine is for you. Additionally, this juicer comes with not one, but two, interchangeable discs to handle softer fruits, like bananas. When compared to other centrifugal juicers on the market, it outperforms them at extracting juice with lower levels of oxidation. It is better at maintaining the stability of the minerals, antioxidants and vitamins. The juice jug is sized at 1.1 quarts and includes a froth separator. It also comes with a huge 3.2-quart pulp container. Though it’s a commercial grade juicer, it’s only intended for household use. Juice Fountain Duo is easy to assemble, coming with a safety locking mechanism that simply pops into place. Once it pops into place, the light on the start/stop knob will indicate that it is ready to be operated. This is an excellent feature, especially since the cutting discs, made of stainless steel and titanium reinforced, are extremely sharp. You do not want to have your fingers near them when it’s operating! It easily juices anything. The cutting and purée discs are easy to switch out to quickly go from juicing to puréeing. Place frozen bananas and strawberries through it to create a tasty smoothie. The wide chute makes it easy to juice whole pieces of produce with little need to cut them, saving on time and effort. Use the food pusher to feed it right into the blades, which are located directly under the chute. It is fairly loud while in operation, but if you have everything prepared before you start juicing, it will only take a few minutes to complete the process. The cleaning process of this juice extractor is definitely easy, but you must clean it immediately after. Everything is removable. Wipe off the base with a clean rag. Rinse everything off to remove food particles and pulp. It is imperative to wash some of the parts by hand. The food pusher, the cutting disc, and the purée disc cannot be washed in the dishwasher. Soak the cutting and purée disc in hot, soapy water prior to washing to help loosen any stuck particles. Then, take the cleaning brush and carefully scrub the inside of the cutting disc to help remove pulp from the fine mesh holes. The remaining parts of the juicer are dishwasher safe and can be placed into the top rack of the dishwasher for cleaning. If you put it next to competing high-speed juicers on the market, Breville BJE820XL is the best one out there. It extracts the highest yield of juices approximately 30 percent more yield. At the same time, it also produces up to 40 percent more enzymes, nutrients, and vitamins. It does produce some foam, but not too much. Even though it is a centrifugal juice maker and pushes air into the juice because of the extremely high RPM speeds, it does have a lower level of oxidation. It yields delicious juice that still gives you plenty of nutrients, especially when compared to store-bought juices. It can be stored for a short period of time in the refrigerator if you put into a tightly sealed container. What Kinds of Produce Can The Juice Fountain Duo Juice? This juicing machine will work best on hard produce, soft fruits and citrus fruits. Hard produce includes fennel, bitter gourd, pineapple, pepper, cucumber, celery, asparagus, garlic, pumpkin, sweet potato, apple, carrots, coconut, yakon, beets, pear, ginger, watermelon, broccoli, cauliflower, cilantro and turmeric. Citrus fruits include lime, mandarin, lemon, orange, grapefruit and tangerine. Using your purée disk you can process soft fruits such as strawberry, avocado, blackberry, cranberries, grapes, kiwifruit, mango, melon, papaya, peach, tomato and pomegranate using the low-speed setting. Thus, it’s not advisable for juicing any of the following—beet greens, lettuce, cabbage, brussels sprout, collard greens, basil, kale, romaine lettuce, pine tree needles, moringa, dandelion greens, spring onion, parsley, wheatgrass, peppermint and spinach. The Breville Juice Fountain Duo BJE820XL is a high-quality centrifugal juicer that is capable of producing healthy, delicious smoothies. It has a high juice yield that tastes great. It is worth mentioning that while it can juice anything, it does not effectively juice greens as well as a masticating juicer. Another negative point that might be a deal breaker for some is that the manufacturer’s warranty is limited to a single year. That means if something breaks a day after one year from the date of purchase, then you will be liable for the cost to replace the broken part. It definitely needs to be extended, especially at more than three hundred bucks to purchase one. However, many users seem relatively pleased with their dual disc juicer so it may be worth the investment after all.